For the month of March, the Shhh Cooking Secretly group decided to make #SummerCoolers as summer is already here. I hear its really really hot in India. It’s hot in Mombasa too and slaving over a hot stove is becoming a very sweaty task. I am grateful that my partner Shobana Vijay gave me such cool ingredients, watermelon and mint. So no boiling milk or making custard or anything of that sort on the stove. All I needed was a blender and the cold fridge. Years back when I had gone for a movie in Ahmedabad with my guardians I had tasted a soda float for the first time. It was ice cream served in what was then available Gold Spot. Remember the so orangy and sickly sweet drink! Well, back then I loved it perhaps because I tasted it for the first time, or because it was a cool satisfying drink for the really hot May month… I don’t know. After that I tasted a coke float, which my kaki loved and I wasn’t too huge a fan of. I decided to make a watermelon soda float and this is for keeps. 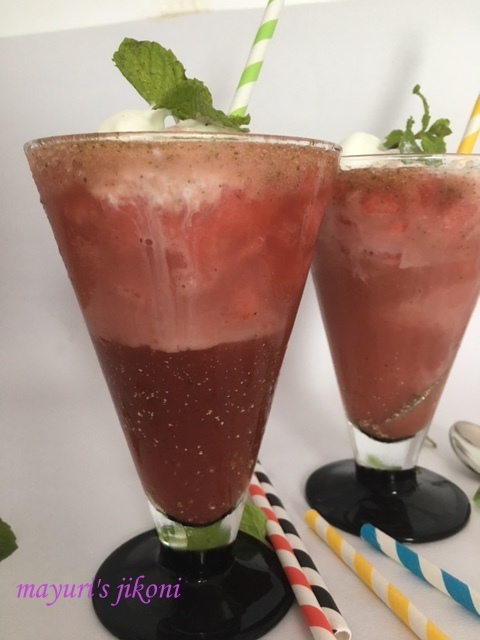 I loved it and it was truly a very cool drink for the hot hot weather…watermelon and mint have cooling properties, I put the soda water in the freezer to chill and yes Ice cream is cold…. so that certainly equals to a cool cool drink. Before you check out the float recipe, take some time to check out Shobana’s Blog , Shoba’s Delight for some interesting south indian recipes. Add the water melon cubes and mint leaves into the blender. Liquidize it. You may need to push the melon down for it to get crushed. You will get about 1-1½ cups of juice. At this stage you may want to leave the juice in the freezer for 15-20 minutes to chill completely. Or prepare it ahead and let it chill in the fridge. To serve, take two tall glasses. Add ice cubes to the bottom of each glass. Add a tbsp each of the chopped fruit. Add ¼ cup each of the chilled soda. Add the watermelon juice. Remember not to fill it till the brim as you have to add ice cream. Finally add a scoop each of the ice cream. Be sure to serve with a spoon otherwise the fruit may get left in the glass. To make a different flavoured float, use any other fresh fruit juice. I liquidized the mint leaves with the melon to get the maximum flavour of this wonderful herb. The most refreshing thing seen today!Awesome recipe! This is a lovely recipe for summer.. I prefer it without ice cream though. Somehow I don't like any milky product in my drinks. I can imagine it is hard to stay cool in such a hot climate – this looks so refreshing and cooling I can almost feel the refreshment! This drink looks so refreshing and lovely to serve at summer garden parties. Thanks Shobha.. I guess you could add sorbets which are not made from milk. Thanks Nayna… that surely would be a wonderful treat for your guests. wow….this is what we need for chennai heat now. Looks totally refreshing Mayuri!! Yummy. I would have never added ice cream but have to try this. Try it out Prathima, am sure you will enjoy it. Thanks.Me too Rafeeda, didn't expect that effect. I normally don't add ice cream too but it just brought back memories and I had to recreate a soda float. I was delicious.